The links below provide access to several geospatial datasets relevant to fire management in Keyhole Markup Language (KML/KMZ) format for use in Google Earth and other virtual globe applications. 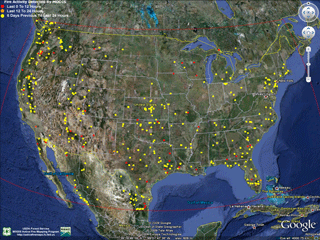 Geospatial data are organized by specified geographic region and include location and characterization of satellite fire detections, current large incident locations and NWS fire weather forecasts. All KMLs update automatically to ensure availability of the latest information (Current link). Animatated time series KMLs are provided for the latest updates of each of the fire detection data layers (Animation link). Access to KMLs for previous dates are provided for relevant data layers (Historic link). Fire Detections - MODIS (1km), VIIRS (375m and 750m), Landsat 8 (30m), AVHRR (1km) and GOES (4km) fire detections by time/date of occurrence within the last 6, 12 and 24 hours, and the 6 days previous to the last 24-hour period. Fire Radiative Power - Measured fire radiative power (fire intensity) for MODIS fire detections within the last 6, 12 and 24 hours, and the 6 days previous to the last 24-hour period. Available for MODIS and VIIRS-AF only. Large Incidents - Location and intelligence information of large wildfire incidents currently being tracked by the National Interagency Fire Center (NIFC) and Canadian provincial and territorial fire management agencies. Fire Weather - Current National Weather Service fire weather watch and red flag warnings by fire weather zone. Available for CONUS, Alaska and Hawaii only. AFM KML Bundle - A single KML containing all available KMLs provided by the Active Fire Mapping Program for each geographic area.